Francis Arinze (born 1 November 1932) is a Nigerian Cardinal of the Roman Catholic Church. He is Prefect Emeritus of the Congregation for Divine Worship and the Discipline of the Sacraments, having served as prefect from 2002 to 2008. He is the Cardinal Bishop of Velletri-Segni (succeeding Joseph Ratzinger, who became Pope Benedict XVI) since 2005. 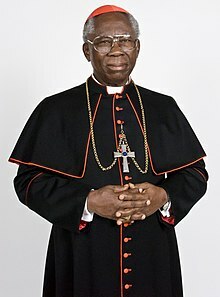 Arinze was one of the principal advisors to Pope John Paul II, and was thought papabile before the 2005 papal conclave, which elected Benedict XVI. ↑ Loyn, David (18 April 2005). "Profile: Cardinal Francis Arinze". BBC News. Retrieved 2009-01-18. ↑ Carroll, Rory. 3 October 2003. "The Guardian Profile: Cardinal Francis Arinze." The Guardian. This page was last changed on 12 May 2018, at 00:46.